The area under the ROC curve (AUC) is a widely used measure of model performance for binary-response models such as logistic models. Hand and Till (2001) proposed an extension to this measure for responses with more than two classes. The MultAUC macro implements this extended measure. The computations performed by the macro are not affected by the appearance of this message. The MultAUC macro requires Base SAS® and SAS/STAT® software. Following this statement, you can call the MultAUC macro. See the Results tab for examples. Specifies the name of a data set containing a variable giving the observed response for each observation and a set of variables providing the predicted probabilities of each observation taking on each of the possible response levels. If the data= option is omitted, then the last created data set is used. The data set should contain only one observation for each observation used to fit the model. Procedures that create an output data set with multiple observations for each input observation must be edited to have only a single output observation per input observation. If the data set to be used is created by the OUTPUT statement in PROC LOGISTIC with the PREDPROBS=INDIVIDUAL option (not the PRED= option), then no alteration of the data set is needed. If a data set from another procedure or other method is to be used, then each probability variable must begin with the prefix IP_ and be followed by one of the response levels. The response levels can be numeric or character. For example, if the response levels are 1, 2, and 3, then the probability variables must be named IP_1, IP_2, and IP_3. If the response levels are Low, Medium, and High, then the probability variables must be IP_Low, IP_Medium, and IP_High. The response level name must exactly match the name used in the probability variable name, including case. Specifies the name of the variable containing the observed response level for each observation in the data= data set. The response levels must be no more than 29 characters in length. If the data set is created by the OUTPUT statement in PROC LOGISTIC with the PREDPROBS=INDIVIDUAL option, then the response= option can be omitted. If omitted, the response variable is assumed to be named _FROM_. A widely used measure of model performance for binary-response models is the area under the ROC curve (AUC) which is related to the Gini index. For a discussion of the ROC curve and the area beneath it in binary-response models, see the Receiver Operating Characteristic Curves section and the related examples in the PROC LOGISTIC chapter of the SAS/STAT User's Guide. See also Gönen (2007). For more on the ROC related capabilities in SAS, see the ROC item in the list of Frequently-Asked for Statistics. Hand and Till (2001) extended the AUC measure to the multinomial case where the response has more than two levels. Their paper provides a good overview of both the binary and multinomial AUC statistics and their properties. Their multinomial measure reduces to the usual AUC when the response is binary (see Example 3). As with the binary AUC, the multinomial AUC ranges from 0 to 1, where 1 indicates a perfect fit and 0 represents a model that performs no better than chance. Note that in the multinomial case, a single ROC curve cannot be plotted. The MultAUC macro is designed to work most easily with the data set created by the OUTPUT statement in PROC LOGISTIC in which the PREDPROBS=INDIVIDUAL option is specified. The PRED= (or P=) option should not be used. When you fit a nominal (LINK=GLOGIT) or ordinal (LINK=LOGIT) model and specify the PREDPROBS=INDIVIDUAL option in the OUTPUT statement, the macro can be called without options. If you fit a different type of model that produces a data set with predicted probabilities of each response level for each observation, then you can edit the data set to make it suitable for use by the macro. See the descriptions of the data= and response= options above for detailed specifications of the data= data set. The results from the macro are the overall AUC as well as the pairwise AUC values for each pair of response levels. No standard error, test, or confidence interval for AUC is currently available. Observations with missing response= variable are ignored. The predicted probabilities (in the IP_level variables) for each observation must all be nonmissing. If the observation was ignored in the model fit, then all of its predicted probabilities are missing and the macro will similarly ignore the observation. "ROC" in the list of Frequently-Asked for Statistics. Hand D.J. and Till R.J. (2001). "A Simple Generalisation of the Area Under the ROC Curve for Multiple Class Classification Problems." Machine Learning 45(2), p. 171-186. This example uses the Iris data set that is used in examples in the PROC DISCRIM chapter and other procedure chapters in the SAS/STAT User's Guide. The Iris data set is available in the SASHELP library. Fifty specimens from each of three plant species are measured on several characteristics. In the following examples, the measurements of the sepal lengths and widths are used to classify each specimen into one of the three species. Several competing approaches are considered – multinomial logistic models (including a restricted model in PROC LOGISTIC and an unrestricted model in PROC GLIMMIX), discriminant analysis (assuming normality of the measurements and a nonparametric, nearest neighbor method), and a classification tree using PROC HPSPLIT. Additionally, an clustering method in PROC MBC is shown that ignores the species response. The first model fit is a multinomial, generalized logit model. The EQUALSLOPES option restricts the slopes on the two logits to be equal in each of the two predictors. Since the PREDPROBS=INDIVIDUAL option is used, the MultAUC macro can be called with no options. The multinomial AUC is estimated to be 0.7582. The pairwise AUCs range from chance level for the Setosa-Versicolor response pair (0.5) to near perfect for the Versicolor-Virginica pair (0.9948). The next model is also a generalized logit model but is unrestricted, allowing for separate slopes on the two logits for both predictors. Since the output data set with predicted probabilities from GLIMMIX has multiple output observations for each input observation, it must be restructured for use in the MultAUC macro. To enable this, a variable (OBS) identifying the input observations is added to the data before analysis. PROC TRANSPOSE restructures the output data to have a single observation for each input observation and creates separate predicted probability variables with IP_ prefix in their names. A DATA step then merges in the variable containing the observed responses. This data set can then be analyzed by the MultAUC macro after identifying the observed response variable. Note that effectively the same unrestricted model can be fit in PROC LOGISTIC by simply removing the EQUALSLOPES option from the above example. However, GLIMMIX is used here to illustrate how its output data set can be modified for use with the MultAUC macro. For this model the overall and pairwise AUC values are all higher than seen for the restricted model above. The overall AUC is 0.93. Another classification method is discriminant analysis. The following statements perform a parametric analysis that assumes that the predictors are normally distributed. The OUT= data set produced by PROC DISCRIM has the basic structure needed, but the names of the posterior probability variables must be changed to include the IP_ prefix. The overall and pairwise AUC values for this analysis are similar to those found for the unrestricted generalized logit model above. A nonparametric discriminant analysis is performed next using the k nearest neighbor method. For this analysis, k=9 nearest neighbors are used to develop the discriminant criterion. The overall AUC is again similar to the best results above. The AUC for the Versicolor-Virginica pair is stronger than in the previous analyses. Next, a tree model is fit in PROC HPSPLIT using the default tree growing and pruning methods. The overall AUC (0.90) is not quite as good as some of the models above. The above modeling methods are known as supervised methods since the response is known and is used in developing the model. There are also unsupervised methods, such as clustering methods, that can be used to find groups in data when the true classifications of the observations are not known. Observations that are similar, based on some criterion, are grouped together in a cluster. SAS/STAT procedures that implement such clustering methods include the CLUSTER, FASTCLUS, and MODECLUS procedures. Model-based clustering is also available beginning in SAS® Viya® 3.4 and is used next. Since this is an unsupervised method, the true classifications in the Species variable are not used. The method finds clusters of the observations based on their similarity using only the SepalLength and SepalWidth measurements. After creating a CAS table of the Iris data, the following statements initialize the method using k-means clustering and request a three-cluster solution. All possible covariance structures, as specified in the CONSTRUCT= option, are considered in choosing a final model. The output data set contains the cluster membership from the model for each observation (MAXPOST) and the posterior probabilities of membership in each cluster (named NEXT1, NEXT2, and NEXT3, where 1, 2, and 3 refer to the cluster number). The COPYVARS= option copies the Species, SepalLength, and SepalWidth variables from the input data set. The following produces a cross-classification of the cluster numbers assigned to the observations and the known Species levels. Notice that cluster 2 exactly contains the Setosa observations. While clusters 1 and 3 do not completely separate the other two Species, cluster 1 contains mostly Versicolor observations and cluster 3 mostly Virginica observations. These statements name the cluster posterior probability variables according to the Species with which they correspond as shown above, and then call the MultAUC macro. The resulting AUC (0.92) is only slightly below the best models above. Among the models and methods considered above, the best performing models as judged by the AUC are the unrestricted generalized logit model and the nonparametric discriminant model with AUC values approximately equal to 0.93. Of course, all of these models and methods of estimating them could be altered in various ways, so it is possible that better models of each type could be found. This example uses the wine data from the Getting Started section in the PROC HPSPLIT chapter of the SAS/STAT User's Guide. The data record a three-level variable, Cultivar, and 13 chemical attributes on 178 wine samples. The following statements creates a random 60% training subset and 40% test subset of the data. Computing the AUC on the data used to train a model can result in an overly optimistic value. By using a test data set for the computation, a more realistic AUC estimate can be obtained. The LASSO selection method in PROC HPGENSELECT can be used to select the important predictors to use in a model. The following identifies Mg and Proline as the final model from the LASSO method. 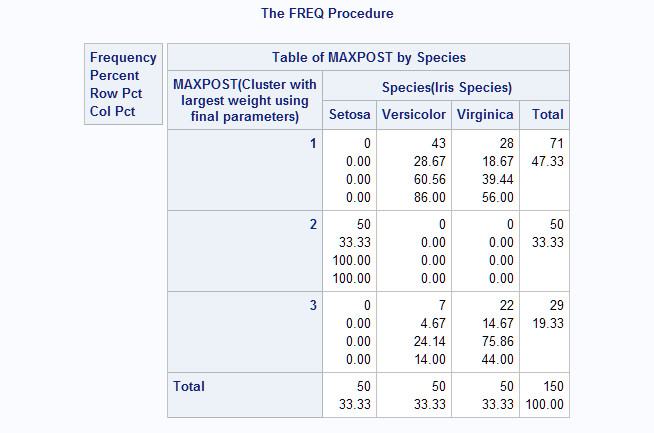 The selected model is fit in PROC LOGISTIC and the test data set is scored by the SCORE statement using the fitted model. The training data set is also scored by the OUTPUT data set. Since the predicted probability variables in the OUT= data set created by the SCORE statement use the prefix P_ instead of IP_, the following DATA step is needed to rename the variables for use in the MultAUC macro. The MultAUC macro can be called to compute the AUC for each of the training and test data sets. Using the LASSO-selected model developed above, the estimated AUC for the training data set is 0.90. For the test data set, the selected model estimates the AUC as 0.89 which is slightly less optimistic than was obtained above from the training data set. This example uses the cancer remission data from the example titled "Stepwise Logistic Regression and Predicted Values" in the PROC LOGISTIC chapter of the SAS/STAT User's Guide. The multinomial AUC proposed by Hand and Till (2001) reduces to the usual AUC when the response is binary. To illustrate this, the following PROC LOGISTIC statements fit a model to the binary response, Remiss, and compute the usual AUC. The predicted probabilities are saved by the PREDPROBS=INDIVIDUAL option in the OUTPUT statement. The AUC is presented as the c statistic in the "Association of Predicted Probabilities and Observed Responses" table and is estimated as 0.753. Next, the multinomial AUC is computed by the MultAUC macro. The same value results from the computation of the multinomial AUC. Right-click on the link below and select Save to save the MultAUC macro definition to a file. It is recommended that you name the file MultAUC.sas. The MultAUC macro provides a generalization of AUC widely used for binary-response models to the case of multinomial models (Hand and Till, 2001).